It is located in the ‘cenote belt’ of Yucatán. To visit, you will need to take the tour of the hacienda Sotuta de Peón, as it sits on its land. 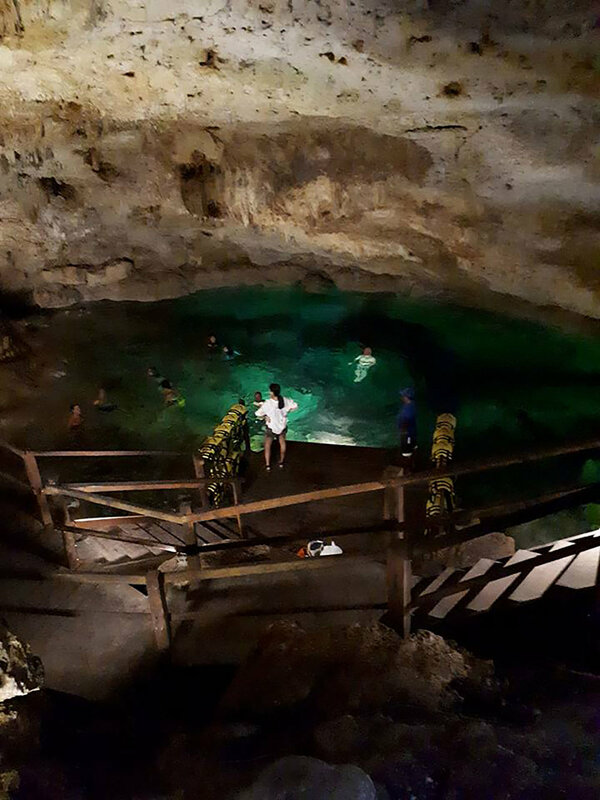 The hacienda tour takes three hours in total while they give you one hour of that time to enjoy your swim in the cenote. The tour is not cheap (550 pesos per person) but it is one of the best experiences to have in Yucatán. The tour takes you through the main house of the owner, the henequén factory and the shredder, followed by a wagon ride on a narrow-gauge rail through the henequén fields to the cenote. The wagon ride through the fields to the cenote. Don Antonio used to work on the hacienda as a child. Today he shows the visitors a Maya hut in the fields (on the right). They basically demonstrate how sisal fibre was made here in the past, which was the main economy of Yucatán in colonial times. As a matter of fact, it made the 50 hacienda families who owned over a thousand haciendas in Yucatán very rich. No wonder they called it 'green gold'. If you do visit, you will understand how Yucatán functioned during colonial times and have the bonus of a refreshing swim. Apparently there are eight cenotes on the hacienda’s land. Dzul-Há (Gentleman’s Water) is the only one open to the public. It means ‘gentleman's water’ in Maya, meaning that only the owner (and his guests) were allowed to swim in it in the past. The other cenotes on the land served to irrigate the fields, as can be seen on the hacienda even today. 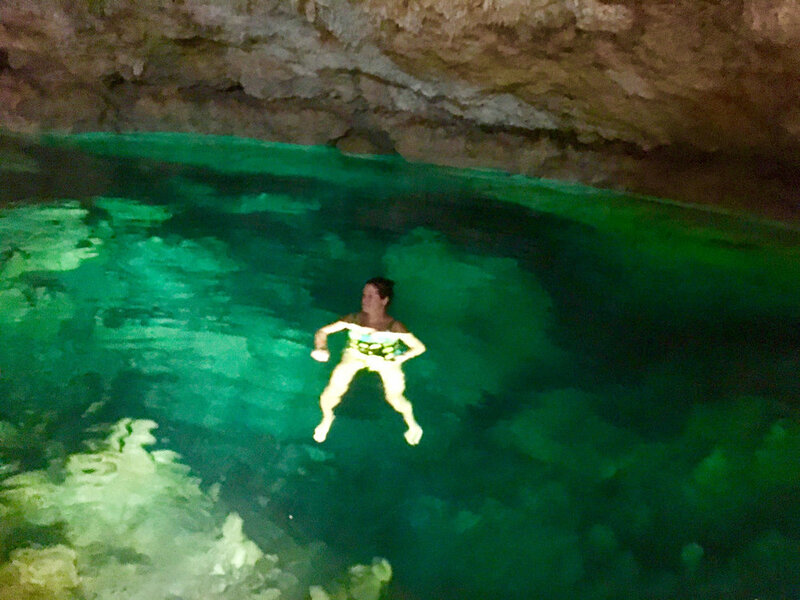 It is a small cave cenote, with perfectly transparent water and grotto atmosphere. The artificial lighting illuminates the stalagmites and stalactites. 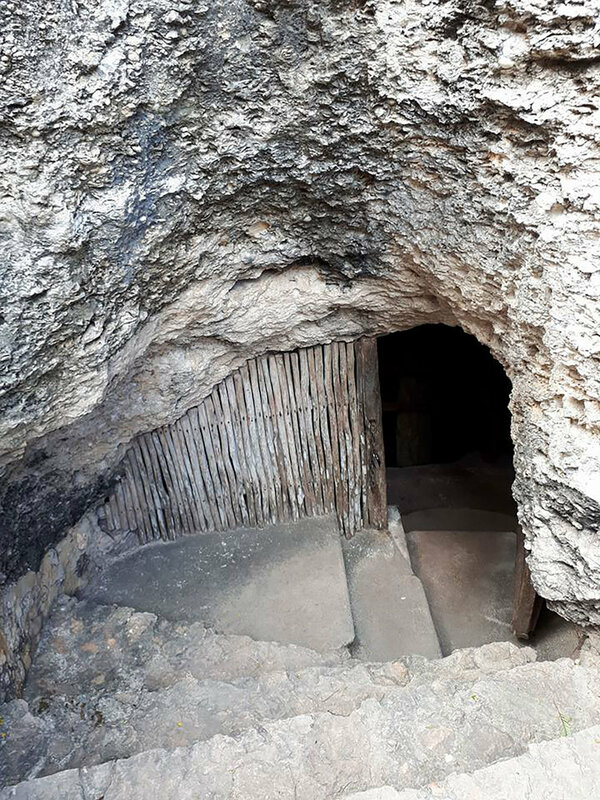 There is also natural light passing through a hole drilled by the hacienda workers in the past, to access the water below. The water is clear as it is filtered by the limestone and also because it is not stagnant. Usually the cenotes are interconnected with tunnels, which must be the case here. The entrance to the cenote. The temperature of the water is around 25°C, like all other cenotes, although I do find it warmer, for some reason. I have been here many times, as I simply love this place. You can snorkel here, or just swim. You can get a life-jacket for no extra charge, and just suspend yourself and sit on the water, observing small fish and rocks at the bottom of the sink hole. After your swim, you can hit the wagon bar and try a Margarita made of ‘sisal’. Yes, it is a local experiment, using henequén rather than blue agave for the hacienda Margarita. There is also a palapa with a massage on offer. And, of course, bathrooms and changing rooms. There is a restaurant on the site and a cabaña hotel with a pool. You can also try a horse ride (for an extra charge). The hacienda is immaculate as it was restored by the current owner Adolf Lube. And Germans create and keep everything in perfect order, as we all know. Tasting Margarita with the hacienda staff. If driving from the Riviera Maya coast, go towards Mérida. Under the bridge just outside the city you need to make a U-turn and then follow the Cancún direction exiting towards Mayapán-Chetumal on your right-hand side. After 24km follow the sign for Tecoh village (by an arch on the right-hand side of the highway). At the village of Tecoh go straight to the main square. Turn right at the public minibus station. Follow this road straight till you reach the village of Itzincab (approx. 12km). Follow straight for 2km until you reach the gate of the Hacienda Sotuta de Peón in the village of Tecoh. There are other routes but this is the one I always use. If you want a full day of hacienda adventure, apart from Sotuta de Peón I recommend Haciena Yaxcopoil, near Sotuta. It is open as a museum. Otherwise, people often combine it with a visit to the Uxmal ruins (one-hour drive) or just sightseeing in Mérida (one hour away).